Your Free Credit Score, Financial Advice & More. This content is not provided or commissioned by the issuer. Opinions expressed here are author's alone, not those of the issuer, and have not been reviewed, approved or otherwise endorsed by the issuer. This site may be compensated through the issuer's Affiliate Program. Opinions expressed here are author’s alone, not those of any bank, credit card issuer, airlines or hotel chain, and have not been reviewed, approved or otherwise endorsed by any of these entities. 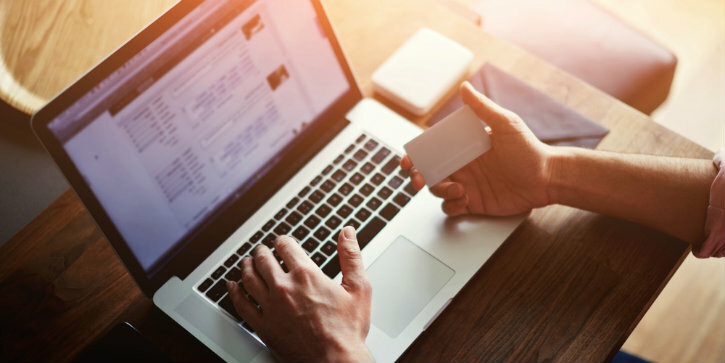 A big part of what makes a high credit card balance feel like an insurmountable mountain to climb are the obstacles that stand in the way of you and your finances. Double-digit interest rates, fees and other terms can keep you stuck in a cycle of debt that’s too expensive to dig out of. One solution is to transfer the debt from one or multiple cards to a brand new credit card with a lower Annual Percentage Rate (APR), or to a card that offers a low or zero percent introductory APR on balance transfers, and more amenable terms, to consolidate your monthly payments and the opportunity to save money on finance charges. Is a credit card balance transfer right for you? Since everyone’s financial situation is different, transferring your debt from one card to another can be a major move. Most of all, you’ll want to know what some of the options are for best balance transfer credit card to consider. A credit card balance transfer is to move all or part of the balance of one credit card to another credit card that has a lower interest rate or to a card with a low or a zero percent introductory APR offer. If you’re paying a high interest rate on your balances, moving the balance to a card with a zero percent introductory APR for balance transfers can drastically shorten the time you need to repay the debt because your payments will be applied to the principal balance, not to a combination of principal and interest. The same payment, therefore, goes farther toward paying down or paying off your debt. Based on the credit card limit you are offered on the new balance transfer card, credit card balance transfers may be a way to consolidate and simplify your payments, especially if you carry debt on multiple cards. Instead of juggling several payments and due dates, you may be able to make one payment toward the debt each month. However keep in mind that the card you transfer your credit card balances to has a credit limit just like all your other credit cards, so depending on how much your balance is you may not be able to transfer the full amount over to the new card. Also before you commit check with the card issuer if they allow balances from other cards in their portfolio of credit cards to be transferred to one of their balance transfer cards – they may not allow that. Although transferring a credit card balance can save you money on interest, most card issuers may charge a balance transfer fee (usually 2-5% of the amount of each transfer) to transfer a balance. The interest savings over time may more than make up for the expense, but the fee does cut into your savings. Here are our top picks for the best balance transfer credit cards available today. The Chase Slate® credit card stands out from the pack, offering $0 introductory balance transfer fee for the first 60 days your account is open. After that, the fee for future balance transfer transactions is 5% of the amount transferred, with a minimum of $5. The Chase Slate® credit card offers a 0% introductory APR for 15 months from account opening on purchases and balance transfers. After that, 17.24% – 25.99% Variable APR will apply. While this 0% introductory APR for 15 months on purchases can be a nice perk for the occasional purchase, keep in mind that the Chase Slate® credit card can be utilized as a balance transfer card, so you may want to consider using it to transfer and pay down credit card debt from a non-Chase credit card and refrain from using the card for other transactions so you can work toward paying down your transferred debt. Make the most out of the balance transfer introductory APR offer by paying it down or paying it off before the introductory offer ends. You may find these features and benefits are a fit for you as well, Chase Slate® credit card has no annual fee and no penalty APR. As far as no penalty APR – paying late won’t raise your interest rate (APR). All other account pricing and terms apply. You get unlimited access to your credit score and more, with Credit Journey℠ – it’s free. And for fast, easy and secure checkout, Contactless, tap to pay wherever you see the Contactless symbol. $0 introductory balance transfer fee for the first 60 days your account is open. After that, the fee for future balance transfer transactions is 5% of the amount transferred, with a minimum of $5. 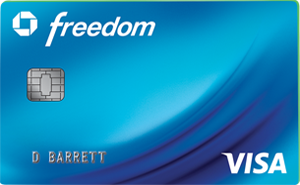 The Chase Freedom® credit card isn’t specifically marketed as a balance transfer card. We think its big selling point is a cash back rewards program that offers Cardmembers 5% cash back on up to $1,500 in combined purchases in bonus categories each quarter you activate, new 5% categories each quarter, and unlimited 1% cash back on all other purchases. What you might not know is that Chase Freedom® has a long-lasting 0% introductory APR that can’t be overlooked if you’re looking to use the card to transfer a balance from a higher APR account. On the Chase Freedom® card, Cardmembers may benefit from 0% introductory APR for 15 months from account opening on purchases and balance transfers, then a variable APR of 17.24-25.99%. There is a balance transfer fee is 3% of the amount transferred, $5 minimum. When managed responsibly, we think the 0% introductory APR for 15 months from account opening on purchases and balance transfers and cash back program offer a serious chance to save money on debt and earn cash back rewards on the things you purchase. All balance transfer and no rewards can make for one dull credit card, and the Discover it® Balance Transfer deftly achieves a balance of both. There is a 0% introductory APR for 6 months on purchases and for 18 months on balance transfers, then 14.24% – 25.24% Standard Variable Purchase APR applies. There is a balance transfer fee of 3% of the amount of each transfer. On the rewards end, Discover it® Balance Transfer has a cash back program where you earn 5% cash back at different places each quarter like gas stations, grocery stores, restaurants, Amazon.com and more up to the quarterly maximum, each time you activate. Plus, automatically earn unlimited 1% cash back on all other purchases. 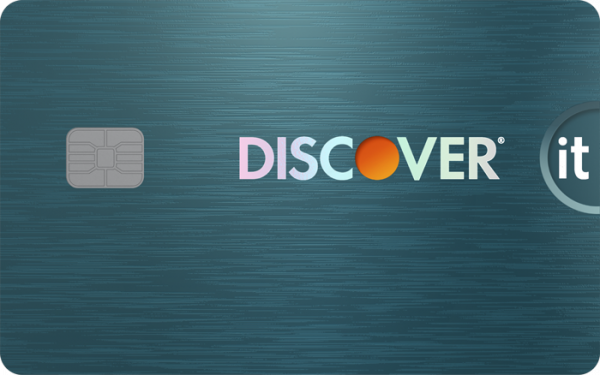 And a nice perk is the introductory offer where Discover will match all the cash back you’ve earned at the end of your first year, automatically, for new cardmembers only. This introductory offer does not require any sign-ups and there’s no limit to how much cash back Discover will match your first year. There is a 0% introductory APR for 6 months on purchases and for 18 months on balance transfers, then 14.24% – 25.24% Standard Variable Purchase APR applies based on your creditworthiness. There is a balance transfer fee of 3% of the amount of each transfer. You earn 5% cash back at different places each quarter like gas stations, grocery stores, restaurants, Amazon.com and more up to the quarterly maximum, each time you activate. Plus, earn unlimited 1% cash back on all other purchases – automatically. There is an introductory offer: Discover will match all the cash back you’ve earned at the end of your first year, automatically, for new cardmembers only. There’s no signing up and no limit to how much is matched. There is no annual fee. If you’re interested in learning more about the Discover it® Balance Transfer card click on the below link which will take you to a card details page. Calculate your total debt amount. How much credit card debt are you carrying? Is it from one card, or multiple cards? Get the facts straight on how much you owe on each card, and their respective interest rates, so you’ll have a clear picture of the amount you’re looking to transfer to a new card, how long it will take you to pay off the balance, and how much you’re likely to save with the lower APR. Keep in mind that the credit card company with the balance transfer offer will have a limit for the amount you can transfer. In addition the card issuer may not allow you to transfer a balance from another card you have with them, so be sure to check any restrictions. Find a card that suits your needs best. If you’re facing a large balance and need time to pay down your debt, you may want to look for a card with a longer introductory APR period, versus a card that offers rewards. Avoid making purchases on the card. If you do plan to use the card for everyday purchases while you pay down your debt, pay off the new charges in full every month, AND make a payment toward the debt you transferred. Otherwise you might dig yourself deeper into a debt hole. If at all possible try not to use the card for any other transactions (purchases or cash advances ) so you can focus on paying down your debt. Calculate the balance transfer fee. Balance transfer credit cards typically charge a balance transfer fee anywhere from 2% – 5% of the amount of each balance transfer. So do the math, if the card charges a balance transfer fee, make sure transferring a balance makes financial sense for you. There are some credit cards that offer a $0 introductory balance transfer fee if you transfer your balance within a specific time period, usually within 60 days of opening your account. Find out what would happen should you make a late payment. If you make a late payment during your introductory APR offer period some issuers may terminate the introductory APR offer and switch to the regular APR or switch to a penalty APR; or assess a late fee. What happens after the introductory APR period ends to any remaining promotional balances? After the introductory period ends, typically the standard variable (or fixed rate) APR will be applied to any unpaid promotional balances and any new balance transfers. Double check with the card issuer as to how any remaining promotional balances will be assessed once the introductory APR period ends, and what the variable or fixed Annual Percentage Rate (APR) you have been approved for is. With so many options it can be hard to choose which balance transfer card you should consider. Your credit score may be able to help you narrow down your options. Based on your credit score and what range you fall into, you can potentially narrow down your search as to which balance credit cards you may be eligible for. If you have good to excellent credit your chances of being considered for a balance transfer card are increased. If you have fair credit, speak to the bank or credit card company customer service team associated with each of the cards you’re interested in to get a better sense of your chances. There are plenty of credit cards with balance transfer deals and they can help you so you can filter through them and find the one that best suits your needs and you may just find one that is available to those individuals with fair credit. As we mentioned before, the credit card companies use a variety of different types of credit scores and other criteria to determine if you are eligible for one of their cards so having a credit score in a particular range is not a guarantee that you will be approved for the card or for the terms you applied for. Is a balance transfer calculator accurate? Balance transfer calculators can be helpful if you are beginning to look into a balance transfer credit card as an option to decrease your overall debt. However, those tools will not be as helpful as speaking with an expert from the bank or credit card company. Definitely utilize all the resources available to you in order to make an informed decision, but remember that these tools come from a variety of sources. A card offering a low or 0% introductory APR for balance transfers can help you decrease the size of your debt by paying off your old debt with a new credit card that has a low or 0% introductory APR offer. Sound confusing? Let’s dive a little deeper into how a balance transfer credit card works. When you get approved for a balance transfer card, you transfer all or a part of your debt from another one of your credit cards to the new balance transfer card. This might sound like a silly solution that is just a quick temporary fix, but it can actually lower the overall amount that you owe. How, you ask? Balance transfer credit cards could offer a lower interest rate than what your current credit card has or offer a low or 0% introductory APR for a set period of time. As we mentioned before this could save you money by reducing the amount you’re paying in interest, which would in essence leave more money that you could use to apply towards your principal balance. Bottom line with a 0% introductory APR offer for balance transfers this would allow you to pay off more of the actual transferred debt without having to worry about interest adding on to your qualifying principal balance during the introductory period. With the good inevitably comes some considerations to be aware of, so it is only fair to inform you that there are some drawbacks to balance transfers that you should know about before making a final decision to transfer your debt. The main concern we want to mention here is a balance transfer fee which usually comes along with the new card you are transferring your balance over to. These fees are not usually a flat rate but rather a percentage of the overall debt you are bringing with you and must be paid upfront. Keep in mind that this cost takes away from the overall savings you are accruing by transferring your balance. Also the issuer of the balance transfer offer will set a limit as to how much you can transfer to the new card, so this may result in a balance remaining on your other card(s), so be prepared, and understand that you are still responsible for paying all balances on all your card(s) and be sure to make those payments on-time. Take a look at the APR the card offers after the introductory APR period ends. This is important information in the event you are unable to pay off your transferred balance before the introductory period ends. First and foremost, when looking for a balance transfer credit card, make sure you read the fine print. Look at the terms and conditions of the card and try to find one that offers a low or a 0% introductory APR for balance transfers with no balance transfer fee or a $0 introductory balance transfer fee. Once you get approved for a balance transfer credit card, organize a payment plan for yourself to pay off as much of the debt as you can within the introductory APR balance transfer period. As you start making payments, be sure to pay them on-time each month otherwise you may be penalized with late fees and the introductory APR offer may end and your interest rate may increase to a penalty APR as a result. Calculate if you can pay off the transferred balance before the introductory period ends and try not to use the card for any additional purchases or cash advances so you can steadily reduce your credit card debt. Lastly, do not close your old credit card account as this will lower your overall available credit which will in turn increase your credit utilization. As a rule of thumb, for the best credit score possible you should keep your credit utilization under 30%. On the other hand, don’t run up debt on your old card again or, as we mentioned, on your new card either for that matter as that could be counter productive and leave you with even more debt to deal with. Are you eligible for the best balance transfer offers? It can be hard to tell if you will be approved for any line of credit, especially a balance transfer card, without knowing where your credit score stands. As you probably already know, credit scores are one factor used to determine your consumer creditworthiness. Lenders look at your credit score and other factors to see if they are willing to take a risk on you as a borrower. With this in mind, it behooves you to get your credit to top status in order to receive the best rates on credit options. By pulling your own credit report and monitoring your credit score you will get a better sense of your financial circumstances and be able to make a more informed decision when applying for cards. Again, a reminder lenders, credit card issuers, and other financial institutions use a variety of different types of credit scores and other criteria to make credit and lending decisions, having a credit score in a particular range is not a guarantee that you will be approved for the card or for the terms you applied for. Independent Review Disclosure: All the information about the Chase Slate® credit card has been collected independently by CreditSesame.com and has not been reviewed or provided by the issuer of this card. The Chase Slate® credit card is not available through CreditSesame.com. Advertiser Disclosure: The credit card and loan offers that appear on this site are from companies from which this site receives compensation. This compensation may impact how and where products appear on this site (including, for example, the order in which they appear). This site does not show all credit card or loan offers available in the marketplace. Credit Sesame is an independent comparison service provider. Reasonable efforts have been made to maintain accurate information throughout our website, mobile apps, and communication methods; however, all information is presented without warranty or guarantee. All images and trademarks are the property of their respective owners. Editorial Content Disclosure: The editorial content on this page (including, but not limited to, Pros and Cons) is not provided by any credit card issuer. Any opinions, analysis, reviews, or recommendations expressed here are author’s alone, not those of any credit card issuer, and have not been reviewed, approved or otherwise endorsed by any credit card issuer. Provider’s Terms: *See the online provider’s application for details about terms and conditions. Reasonable efforts have been made to maintain accurate information, however, all information is presented without warranty or guarantee. When you click on the “Apply Now” button, you can review the terms and conditions on the provider’s website. Offers are subject to change and the terms displayed may not be available to all consumers. The information, including card rates and fees, presented in this article is believed to be accurate as of the date of the article. Please refer to issuer website and application for the most current information. Verify all terms and conditions of any offer prior to applying. Responses are not provided or commissioned by the bank advertiser. Responses have not been reviewed, approved or otherwise endorsed by the bank advertiser. It is not the bank advertiser’s responsibility to ensure all posts and/or questions are answered. Reviews: User reviews and responses are not provided, reviewed, approved or otherwise endorsed by the banks, issuers and credit card advertisers. It is not the banks, issuers, and credit card advertiser’s responsibility to ensure all posts are answered. The Credit Sesame website star ratings are an average based on contributions from independent users not affiliated with Credit Sesame. Banks, issuers and credit card advertisers are not responsible for star ratings, nor do they endorse or guarantee any posted comments or reviews. Disclaimer: The article and information provided here is for informational purposes only and is not intended as a substitute for professional advice. You can trust that we maintain strict editorial integrity in our writing and assessments; however, we receive compensation when you click on links to products from our partners and get approved. Paul specializes in personal finance, credit, consumer trends and other interesting stuff worth writing about. Which factor has the largest impact on your credit? Do you know your credit? Payment history has the largest impact, weighing in at 35% of your credit score. The correct answer is payment history with a 35% impact on your credit score. Get your score for free! Find out your exact credit score for free today & get access to free credit monitoring and real-time alerts. Let's get you on track! Lexington Law can help you better your credit by correcting errors on your credit report. Work towards using only 30% of your credit limit for a positive impact on your credit profile. How does this affect my score? Way to keep it below the recommended 30%! Refresh the page to try again! Find out how these factors are affecting your score. Don't know your score? Get it for free! Find out your exact credit score for free & get access to free credit monitoring and real-time alerts. The credit card and loan offers that appear on this site are from companies from which this site receives compensation. This compensation may impact how and where products appear on this site (including, for example, the order in which they appear). This site does not show all credit card or loan offers available in the marketplace. Credit Sesame is an independent comparison service provider. Reasonable efforts have been made to maintain accurate information throughout our website, mobile apps, and communication methods; however, all information is presented without warranty or guarantee. All images and trademarks are the property of their respective owners. How Does Credit Repair Work? Copyright © 2010 - 2019 Credit Sesame, Inc. | All rights reserved. Get your credit score and monitor your credit report—for free!